"These sweet potatoes are a Thanksgiving favorite at my house." Place sweet potatoes onto the prepared baking sheet, and bake in preheated oven until soft, 45 minutes to 1 hour. Remove from the oven and allow to cool slightly before peeling and placing into a large bowl. Preheat oven to 350 degrees F (175 degrees C). Butter a 2 quart casserole dish. Mash the warm potatoes along with butter, cream, vanilla extract, brown sugar, salt, 1/2 cup maple syrup, 1 cup chopped pecans, and eggs. 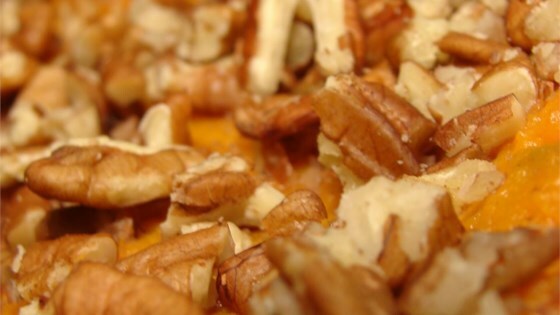 Spread mashed sweet potato into the prepared baking dish, and sprinkle with the remaining 2 tablespoons of maple syrup, and 1/4 cup of pecans. Bake sweet potatoes in preheated oven until thoroughly hot, 30 to 35 minutes. Was wayyyy too sweet and it wouldn't harden. It tasted like maple sweet potato syrup. It tastes even MORE sweet after it cools down. Tried it twice. Not doing it again. The best sweet potatoes I have ever tasted. Even better than my mother's. Thank you for a wonderful recipe. I will be making this for MANY years to come. fantastic!! Super sweet though. I recommend a little less brown sugar and vanilla extract (they are sweet potatoes after all) Thank you!! I made this with my traditional Thanksgiving dinner last year. This week I needed some easy to prepare comfort food and went straight for this recipe. Thank you for posting it!